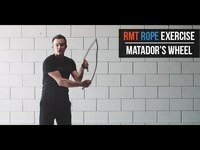 Overhand rope workouts using the RMT Rope unites your hands, shoulders, biceps, and chest while performing three dimensional fluid movement patterns with a focus on pronation. Overhand rope workouts improve your “fight" response and integrate, strengthen, and coordinate both sides of your body. These videos will teach you the exercises to utilize these movements.